Weekday meals are a time to apply the KISS principle (keep it simple, stupid). Today’s post is a Japanese inspired KISS menu. The only time consuming element of the meal is the miso pork, which really needs from four to twenty-four hours to marinate. Not being sufficiently prepared I cut it down to two hours, but it really needed a bit more. That said, it was still a nice flavourful dish and suited the simple theme of the meal. 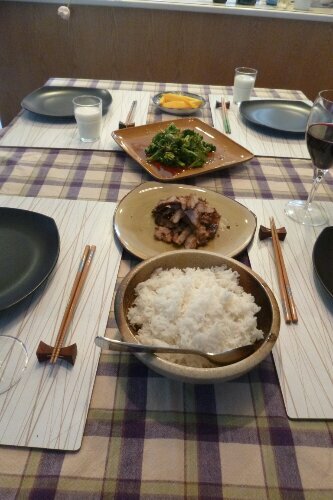 The miso pork recipe I used was taken from the Just Bento blog and is available here: (butaniku no misozuke). I increase the sugar content a little and add mirin and sambal oelek to jazz it up a bit. One thing I’ve found with this recipe is to make sure the pork is pounded nice and thin and to get it out of the pan the moment it’s cooked. Leftovers are great in Bentos the next day, so always make a little extra. Most weekday evenings usually find the various family members shooting off in different directions for sports, clubs and courses. However, when the stars align and everyone happens to be free for the dinner hour, I like to put in a little more effort. This time it was a Japanese themed meal. The prawns turned out well but are still a work in progress. I’ll write more about this in a separate post and do a proper recipe once I’ve worked out all the bugs. I drizzled them with tonkatsu sauce prior to serving. The Wakame salad is a shredded seaweed dressed with sesame oil, sesame seed and sugar available at the local Korean market. It’s also sold in Japanese markets and even Costco locally. I can’t get the correct seaweed base, so I don’t try and make it myself. The rice is white extra-fancy grade short grain rice commonly used in making sushi. It’s commonly called “California Rose” in North America, but not always identified as such on the packaging. Total prep and cooking time: about 60-90 minutes. Prepare Vegetables and Dashi stock. Mix last 4 ingredients in a small bowl and set aside. Heat cooking oil in a non-stick frying pan over medium element. Add peppers and beans to pan and stir-fry until partially softened. Add mushrooms and ginger and stir-fry for a minute or two. Cover the pan and cook until the mushrooms begin to sweat. Shake the pan occasionally to prevent over browning. Remove the cover and add the sauce. Continue stir-frying until most of the liquid has evaporated. 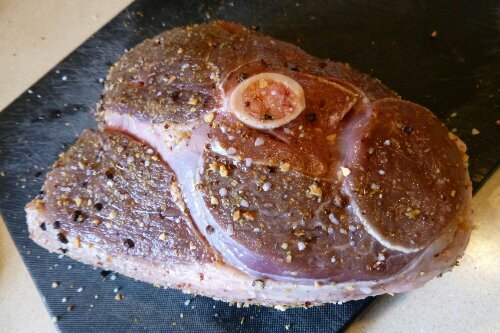 Add Seven spice powder to taste (a pinch or two is enough). Serve on a decorative dish, warm or at room temperature. Notes: An easy dish that takes approximately 10 minutes to prepare, assuming you use instant dashi or have it prepared in advance. Adapted from Japanese Cooking: A Simple Art, by Shizuo Tsuji. *While this recipe/menu is listed as GF please note that it assumes all ingredients are certified GF.